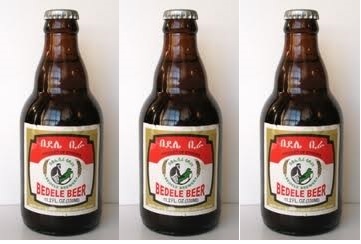 community in Ethiopia have started a well organized campaign against Bedele Beer owner for becoming the main sponsor of the upcoming tour of Teddy Afro. The campaign started when Teddy Afro known for his infatuation with past emperors was quoted glamorizing Atse Minilk’s conquest and his expansion of Ethiopia towards south where many of the Oromo community lived. It is said Atse Minilk army was very harsh against the Oromo people and other communities in the area. Many argue, Atse Minilk – partially from the Oromo ethnic himself, harsh treatment of the people was not unique since most of the feudal emperors before him were also harsh to the Amhara, Tigreans and the Afars. In the West when people get frustrated with certain companies act they usually start a boycott campaign to punish the company where it hurts. This has been a very known and effective tool in many of the well established democratic countries. Unlike the old days where Ethiopians always turn a simply disagreement in to a quarrel of zero sum game outcome, this time, the Oromo activists are using a proven tool to make their voice heard. We say amen to this, but what about you? Also, we were taken back when we heard after coming this far in the democratic process and after building the strong foundation of the new federal democratic Ethiopia, the Orormia regional government has given a go ahead to build a museum somewhere in Arrsi that will hold a controversial statue. The statue is said to represent Atse Minilk’s atrocities against women. We think this is not what Ethiopians need to bring forth at this point in time. Now is the time to forgive and move on against the common enemy we have that is poverty. Never mind about the veracity of the history behind the statue. We do not need to go that far to find out of our brutal emperors and governments before. We have the Mengistu Hailemariam government with a much more horrific stories. The question is why was OPDO not persuasive enough to ask the locals to focus on the current issue than the past? We understand some of the dysfunctional opposition infatuation with emperors of the past! At times it is irritating but why fall for their trap? These oppositions are left over’s of the last supper that was served some 22 years ago! Can’t we forget them and move on? Have Your say!! Time to Bring Eritrea in from the Cold –Says Herman Cohen! The relationship started to cool in 1997 when the Eritreans created their own currency, the Nakfa. They did this without arranging to establish a system of daily settlements for cross border trade between their currency and the Ethiopian Birrh. This could have been done through a facility provided by the International Monetary Fund. Without such a facility in place, the Ethiopian Government announced that all cross border trade had to be settled in US Dollars. This resulted in a financial setback for Eritrea because of its limited access to hard currencies. However, as far as external support for Shabaab is concerned, all available intelligence indicates that Eritrea has not had any contact since 2009. Earlier intelligence reports, denied by Eritrea as fabricated, indicated Eritrean facilitating the transfer of funds to Shabaab – nothing of that sort has been reported since 2009 by any source. Those of us who know Eritrea well understand that the Eritrean leadership fears Islamic militancy as much as any other country in the Horn of Africa region. Now that you have read Mr Cohen’s argument what do you think? Do you think it is the time to save the dying regime of Afeworki as Mr Cohen says or it is the time to stand firm. Do you think Ethiopia/PM Hailemariam govt should revisit the EEBC fiasco/decision even though the Eritrean regime has violated it many times before or stand firm with the proposal PM Meles government put on the table long time ago – that is to demand for a sit down negotiation to solve all the issues between the two countries, no precondition including handling of any territory. Have Your Say and do not let Mr Cohen have the last Say on this with his own pre condition of transferring Badme or any place for that matter! If you look deep in to this picture and fall back in to memory lane imagine how many of our people suffered to bring such development. 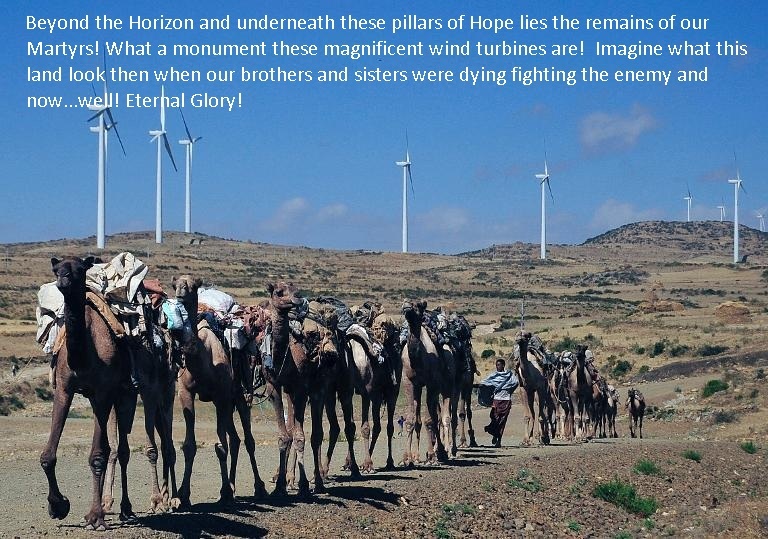 Seeing these magnificent towers of hope and energy it looks as if they are there to represent those who died. The battle to defeat poverty once for all started as you all know in these hills – so to speak. These and other similar hills all over Tigray hold in them the remains of those gallant fighters who died. With time passing those who died to bring peace, justice and development may be fading away from our memory but we sure hope projects like these will keep them fresh for eternity. Look at the picture and share what comes to your mind, have your say! Unlike the early days of the online media, we have all learned not to be easily shocked, surprised, or overly excited by what we read online. Mostly, we try to verify the reliability and reputation of the source. Sometimes, we try to analyze the characters or personalities affiliated in an outrageous story or analysis and we raise questions like….did he/she really say that? …Really? Would he/she say that? What would be his/her motive to be so wrong? and so on. When we read Ana Gomez’s interview with a journalist from a local private media, we didn’t even doubt the authenticity of this story knowing it is the angry Hana Gobeze spewing her venom again. By the way, she likes her nick name and she is flattered to be named as Hana Gobeze. May be we are wrong referring to the interviewer as a journalist… sounds more of an opposition spokesperson according to his line of questioning and his opinion of her being respected by ‘a lot of Ethiopians’. That’s beside the point….You will judge for yourself. At first, we wanted to sit down and write to respond to what she said line by line, but decided not to, because she is overwhelmingly wrong, biased, angry, arrogant, and filled with vengeance. After reading this transcript and trying to make sense of her anger and the personal hate she harbors against the great leader, the late PM Meles Zenawi, one can easily conclude that she must have been really hit hard where it hurts the most the way PM Meles cut her to size last time! While failing miserably on her analysis and wrong on all points, we have to admit that she is right about one thing she said….” She doesn’t pretend to know Ethiopia well enough”. You are darn right ! You, including your confidants, don’t know Ethiopia and it will stay a mystery to you forever. She even dares to tell us that poor countries like Ethiopia don’t have the right to protect their people against terrorism and she says that’s reserved for the rich, developed, and powerful countries. This angry woman says a lot more. Read on(here) and Have Your Say below…!